(CNN) -- Wajeha al-Huwaider picked up her passport, got in a taxi, and headed from her home in eastern Saudi Arabia to the nearby island kingdom of Bahrain -- a 45-minute drive that many Saudis take to get away for the weekend. Wajeha al-Huwaider says women face too many controls in Saudi Arabia. Despite having a valid passport, Saudi authorities at the border sent al-Huwaider home. That's because in Saudi Arabia, a woman needs permission from her male guardian before she can leave the country. Al-Huwaider -- a vocal women's rights activist in Saudi Arabia -- knew before she left that she would be turned away at the border. Her attempted trip was simply to make a point about the Saudi guardianship system that she says "controls all aspects of women's lives." "Either you treat us like mature citizens or let us leave the country (permanently)," she told CNN. She's urging all Saudi women who are tired of "being oppressed" to go "to any border and try to cross it without permission from their male relative." She wants to end Saudi Arabia's strict guardianship laws in which women must get permission from their husband, father, or closest male relative before doing the most mundane of tasks -- including working outside the home, going to school, maintaining a bank account, or leaving the country for a weekend getaway. Saudi Arabia is conflicted when it comes to women's rights. Women are not allowed to vote or drive, but earlier this year Saudi King Abdullah appointed Nora al-Fayez as the kingdom's first female deputy minister of education as part of a massive Cabinet reshuffling. Many consider Abdullah to be a reformer and the move was hailed within Saudi Arabia as a great step forward for women's rights. But al-Huwaider sees it differently, claiming even a woman as powerful as al-Fayez "isn't really in control of her life." "If she wants to travel is not up to her, it's up to her male guardian," she said. Human Rights Watch has criticized the Saudi government for not living up to commitments it made to the United Nations Human Rights Council. HRW issued a report last year detailing the negative impact of the guardianship system on Saudi women. It said Saudi officials have asserted that such guardianship requirements do not exist. "The Saudi government is saying one thing to the Human Rights Council in Geneva but doing another thing inside the kingdom," said Sarah Leah Whitson, HRW's Middle East director. "It needs to stop requiring adult women to seek permission from men, not just pretend to stop it." Efforts to reach the Saudi government for comment were unsuccessful. HRW issued a report last year detailing the negative impact of the guardianship system on Saudi women. It said Saudi officials have asserted that such guardianship requirements do not exist. Last month, al-Huwaider tried three times to cross from Saudi Arabia into Bahrain on her own and without permission from a male guardian. She was turned back each time but she said she'll continue going to Saudi's land borders and its airports in an attempt to gain "her rights." She has even protested on the side of a major road, the King Fahd Causeway that connects Saudi Arabia to Bahrain. 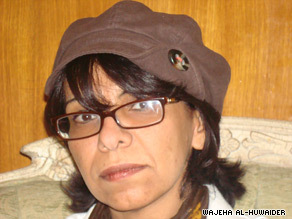 Al-Huwaider insists this campaign is different from previous ones she's been involved in. "It's not about just sending messages and petitions anymore," she said. "We're not going to send any letters to anyone. Saudi women have to find someone who will take them to an airport or a border and say that they don't approve of the system and that they want to leave." She said that her mission is more than just an act of civil disobedience. "Most of the people think I'm doing it just to allow women to travel without permission," says Al-Huwaider. "But I keep telling women that it's the whole system that needs to be changed."